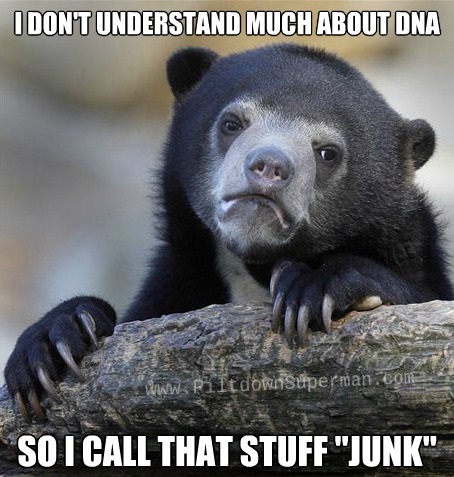 As we have pointed out before, pompous Darwinists studied some of the human genome, did not understand certain aspects, and labeled them as "junk" DNA — especially if they did not code for proteins. This reaction became zombified, reappearing time and again to make strong men faint and women scream. And this is in the science lab. Okay, so I exaggerate a mite, but with additional research comes additional embarrassment for arrogant evolutionary scientists who spoke from evolutionary assumptions and without knowledge. The transcription of information into RNA is pervasive. There are different sections with different functions, including long non-coding RNA, lncRNA. There's a heap of the stuff, and it has very precise functions that are being analyzed. No, scientists do not understand the genome yet, but progress has been made. The genome testifies of the ingenuity of our Creator, and frustrates evolutionary speculations. In addition, some scientists in biomedical genomics are working mighty hard to cure disease, and are not letting evolutionary ideas hinder their work. To read the rest, click on "Pervasive Genome Function Debunks Junk DNA".